Sweet and Spicy Mixed Nuts was this morning’s “snow day” project because of my 2019 resolution–Eat Nuts. I’m trying to add more nuts to my diet because plain and simple, they’re good for you. Nuts are a huge part of a Mediterranean Diet, which I’ve been reading a lot about. The diet is considered by nutrition experts to be one of the healthiest diets with antioxidants, vitamins, omega-3s, and healthy fats in nearly ever dish. So why nuts? Studies show that Americans, compared to the rest of the world, don’t eat enough nuts (peanuts don’t count because they are technically not a nut). Other than those found in the snack aisle or the bowl of nuts with shells at Grandma’s house during the holidays that everyone seems to love to crack, nuts aren’t not part of the American diet. Given all the nutrients in one little nut, and since I love nuts, I decided it would be simple to add them to my diet. But there are a few downsides to nuts. They have a lot of fat, good fat but still fat, and calories. Also, they are PRICEY! After all that I’ve read that’s good about them, though, I’m taking the plunge and adjusting my grocery budget to include nuts. 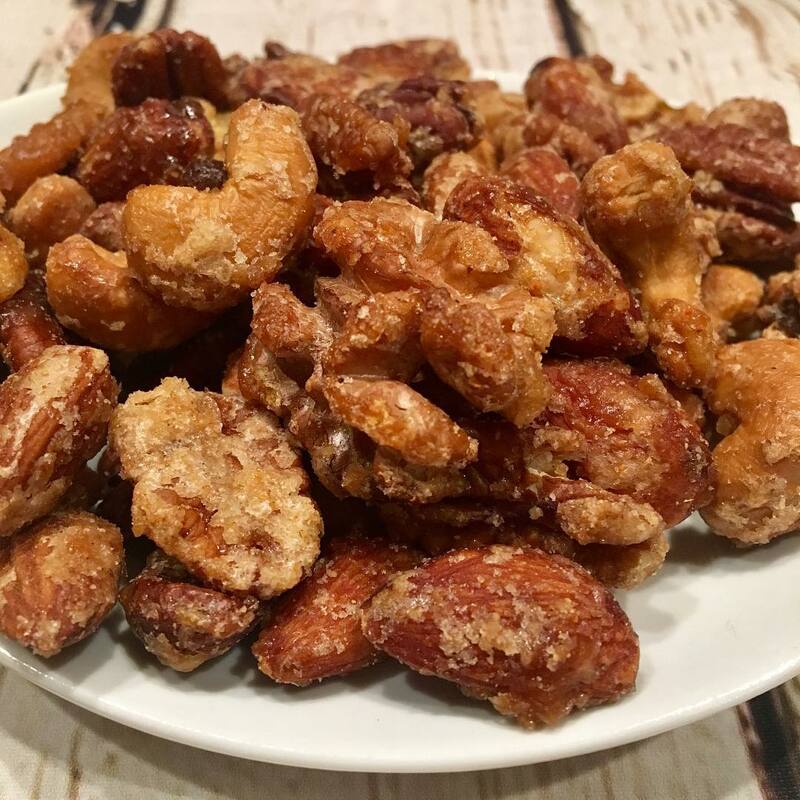 I know I’m talking about all the healthiness of nuts, but you’re probably thinking this recipe for Salty, Sweet and Spicy Mixed Nuts doesn’t look so healthy. And, you’d be right! I’m definitely looking the other way when I add all the sugary sweet coating to these. So yes, they’re loaded with all things bad like sugar (the pure white stuff) and fat (REAL butter), but I just couldn’t resist making them. Wait until you taste them. You’ll understand what I mean. They are ADDICTIVE! There are times when I try to justify and rationalize why using unhealthy ingredients can be okay. This is one of those times. So here I go. Let me remind you that nuts are healthy–loaded with protein, omega 3s, and antioxidants–and we don’t eat enough of them. Therefore, there is still a HUGE health benefit from these Sweet and Spicy Mixed Nuts. The sugar and fat combination makes it really REALLY hard to eat just a few. I kept finding myself going back for “just a couple more” way too many times. BUT my plan is to keep these on hand to use in moderation. These will be the perfect addition to my salads year round. And since salads are filled with nutritious vegetables and fruits (justify and rationalize), I figure a little bit of sugar and fat won’t hurt too much. Oh yes, MODERATION! Making these is a breeze. Super simple. You need 4 cups of nuts. I chose walnuts (the nutrition KING of nuts), pecans (because they’re my favorite), almonds (because they’re also really good for you), and cashews (to fancy things up a little). Feel free to pick your favorite combination of nuts–they all work with this recipe. You melt butter and add the sugar, salt and spices. I use a little less than 1/2 cup because it’s A LOT of sugar. Each time I make this recipe for Sweet and Spicy Mixed Nuts, I cut the sugar by just a little bit. I’m trying to tone down the sweetness and still keep the coating sticky enough to stick to the nuts. I also like to play with the seasonings too. My favorite change has been to swap out the cayenne pepper for smoked paprika. I LOVE that smokey flavor, but it can be too much for some folks. You be the judge. PREHEAT oven to 350 degrees. LINE a baking sheet with foil and lightly spray with cooking spray. COMBINE nuts in a large bowl. HEAT sugar, water, butter in a small saucepan over medium heat until the butter is melted. ADD salt, black pepper, cumin, cayenne pepper. STIR to combine. Slowly POUR butter mixture over the bowl of nuts and STIR to coat. PLACE nuts on prepared baking sheet. SPREAD into a single layer. BAKE for 9 minutes. STIR the nuts until the syrup coats every nut evenly. SPREAD again into a single layer. RETURN to the oven. BAKE another 5-6 minutes until nuts are sticky and almost all of the buttery mixture coats nuts. COOL before serving. It’s January, it’s FREEZING cold, and it’s time for Quick Tortellini Soup. Actually any soup is perfect this time of year for warming the belly, but I love using frozen or refrigerated tortellini instead of noodles or rice in my soup to add some variety. It’s quick and easy, and just plain fun…. Cranberry Jalapeno Salsa Lately I’ve been reading a lot about how important it is to regularly include jalapenos and cilantro in your diet. That’s so simple for me to do in the summer, but it’s not summer. So I had to come up with an idea to include these two nutritional powerhouses in my diet….